Basic information to know if you are coming into the office for a thyroid ultrasound. Can I eat or drink prior to my ultrasound? Yes! There is no need to go without food or beverage prior to an ultrasound including an ultrasound with a fine needle aspiration biopsy. What should I wear to my ultrasound? It is recommended that you wear a button up shirt instead of a high collared shirt. V-neck shirts or any shirt that gives access to the low neck area work well. Does an ultrasound expose me to radiation? Unlike CT scans or x-rays there is no radiation involved with an ultrasound. These procedures can be repeated as many times as necessary with none of the risk of radiation exposure associated with x-rays or CT's. Absolutely not! 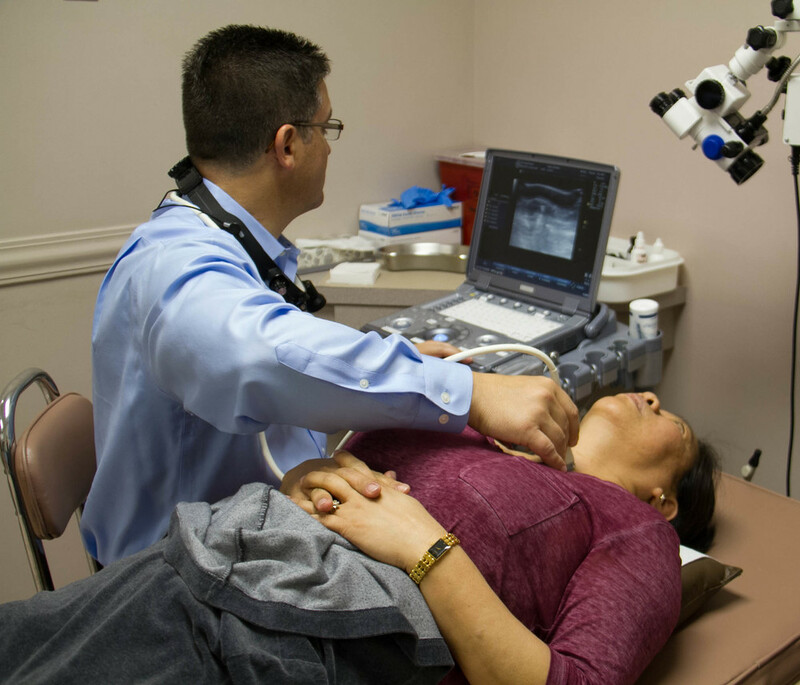 A neck or thyroid ultrasound uses the same machines that are used to examine pregnant patients. This is one of the easiest tests we do! What if I already had an ultrasound at the hospital? While reviewing prior test or reports from prior ultrasounds is useful, it does not replace the information gathered by seeing the ultrasound firsthand. As a thyroid surgeon, I strongly prefer to perform the ultrasound myself from both a decision making as well a surgical planning point of view. The old saying a picture is worth a thousand words is certainly true when it comes to imaging thyroid and neck structures! How can I tell what my ultrasound shows? Unlike looking at babies, the ultrasound of the thyroid in the neck doesn't make much sense to most people. I'm always happy to point out what I'm looking at! Even if you've never seen an ultrasound of the neck before, usually seeing the images on the screen can help you understand what's going on in your individual case. Family members and friends are welcome to attend your ultrasound session if you would like them to see the images as well. Will you post my ultrasound on this website? Certainly, if it's very unusual and interesting! If you'd like to show off your ultrasound to your friends and family just ask, and I will get representative images up for you. How often does an ultrasound need to be repeated? This is highly dependent upon my index of suspicion and varies with both patient factors as well as ultrasound factors. Christ-centered care specializing in thyroid, parathyroid surgery and head/neck cancer oncology. I will also see adults and children for ENT problems ranging from the basic things like ear tubes, tonsils and allergies to the most complex sinus problems. My belief is that educating patients and families well leads to better decisions and improved outcomes. Want to make an appointment with Dr. Keith? Have a question? Complete this simple form! We will get back to you as soon as possible! Thank you! You should be contacted within 24 hours! Do I need a second opinion? Copyright © 2012, Keith Forwith. All rights reserved. Site & artwork created by Bridges Media L.L.C.